Isn't this a beautiful Victorian Style home? You can't see all of it because of the shrubbery and trailer park at the base of the house. It made me curious about the history of the house so I looked it up. Here is what I found. This is the historical information I found written HERE. 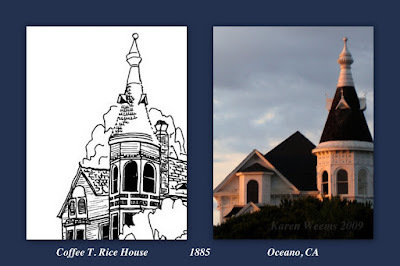 Coffee T. Rice was a wealthy financier, with enterprises throughout the State, who migrated from Ohio to San Francisco. When a railroad was surveyed through this area he envisioned an industrial center here and acquired various properties close to the right of way. He introduced celery production to the area. Rice started construction on his home in 1885 using the same craftsmen that were working on the Pitkin House. The house originally had 20 rooms and was painted yellow. Surrounded by well-kept grounds with various trees and a sundial, the house was approached by an oval driveway and a stone-pillared entryway. The grounds also included a paddock, racetrack and various other outbuilding.s This original kitchen was too small, so a large one was added to the back; this has since been removed. Some of the materials used included mahogany, teak, marble and tile. Wall construction was of 2 x 6 rough studding, sheeting and siding and redwood lath covered with plaster. Bathtubs and sinks were of marble, fireplaces were of marble and hand-made Italian tile. Furniture came from the east coast. The house was completed in 1886. Hard times befell Rice; his son was killed in a riding accident, his wife suffered from neurasthenia and he lost his fortune due to the slow construction of the railroad. By 1895 when the first train rolled in, Rice had moved out. Lewis C. Routzahn, his wife and three sons occupied the house in 1897. At this time, the third floor was still unfinished, containing only scaffolding. In 1905 the house and land were purchased by the Temple of the People (The Halcyonites). The third floor was completed and the building used as a sanatorium until 1925. Various other people lived there until its sale in the 1940's. Most of the plumbing was removed at that time. The third owner, James Olin, did some renovation. In 1959 Mr. and Mrs. Melvin Fowler purchased the house. They lived in the house and did some restoration and alterations, including remodeling the kitchen and the addition of a trailer park. The last sale of the house and property was in 1965 to Robert conway who converted part of the ground floor into a recreation room and the second floor into apartments. The house is presently needing to be painted, plumbing stacks the exterior and trailers are parked all around.